The Hoxton Thirteen. Tansy DAVIES: Patterning (2000); Jonathan POWELL: Saturnine (2000); Mary BELLAMY: Constellations (1998-99); Morgan HAYES: Buoy (1998); Richard BAKER: Los Rábanos (1998); Sam HAYDEN: Partners in Psychopathology (1998); Alison KAY: Rat-race (2000); Jonathan COLE: Caught (1998); Rachel LEACH: Green Plastic, Pink Oil and Water (1998); Alastair STOUT: Deep in Your Coral Caves (2000); Julia SIMPSON: A Beast of Burden (1998); Oscar BETTISON: Cadence (2000); Deborah PRITCHARD: Chanctonbury Ring (2000). Composers Ensemble, Peter Wiegold (cond.). NMC D076 (http://www.nmcrec.co.uk/). Live from the State of the Nation 2001. Jo THOMAS: Wolfie (1999); David HORNE: Broken Instruments (1999); Fraser TRAINER: The Colour of Scars (excerpts) (2001); Rolf HIND: Solgata (1999-2000); Larry GOVES: Walking Underground (2000); Tansy DAVIES: Small Black Stone (1999-2000); Luke BEDFORD: Five Abstracts (excerpts) (2001); Joe CUTLER: Without Fear of Vertigo (2001); Richard AYRES: No. 24 Noncerto (1995); Peter BATCHELOR: Steamin’ (2000). Rolf Hind (piano); London Sinfonietta, Pierre-André Valade (cond.). NMC D078 (http://www.nmcrec.co.uk/). 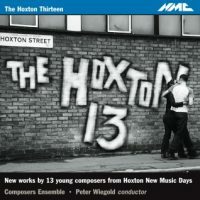 The Hoxton Thirteen is a collection of new pieces by 13 of the young composers represented at the Hoxton New Music Days of 2000, a summer festival in England. All the works were written for the Composers Ensemble, a sextet-plus-conductor chamber group consisting of flute, clarinet, piano, percussion, violin, viola and cello. Composers were not obliged to use all six players and most did not. What’s most surprising — even alarming — is how similar some of these 13 efforts sound. It’s as if several of these composers wanted to pack in as much 20th-century technique as possible at the expense of interesting musical material. I do not mean to be cruel and dismissive, but few of the pieces jump out. Most are fast and bright with lots of notes and a consistently busy texture. There are but a few exceptions. The opening work, Tansy Davies’ Patterning for piccolo, clarinet, violin, cello, piano and percussion, alternates frenetic action with slower stuttering motion. A startling piano solo just past the halfway point sounds like the pianist’s hands ought to belong to two different people, and I had to listen to this one a few times. Mary Bellamy’s Constellations for flute, clarinet, violin, viola, cello and piano is also full of stops and starts, using a language with contours reminiscent of Boulez and Donatoni. Richard Baker’s Los Rábanos for clarinet, violin and percussion is a gentle exploration of a Mexican song that ends dreamily with the tune high on the clarinet against pitched percussion, the violin holding a high pitch that almost vanishes into the background. Oscar Bettison’s Cadence employs the full chamber group; all the instruments begin in unison with a descending lachrymose gesture that gradually fans out and becomes embellished. This piece has some of the slowest material on the CD. The gesture at the core of this short work reminds me of Luc Ferrari’s Histoire du plaisir et de la désolation (ADDA 581156), and I wonder if both works refer to a Pavane or some tune I should know. Within the CD booklet, each composer is allotted but a single page for picture, bio and program note, and Bettison’s note is the shortest and most glib: “Rather like this sentence, Cadence is about a single idea.” Bettison got my attention with his music, not his program notes. Live from the State of the Nation 2001 offers 10 pieces whose variety is welcome after The Hoxton Thirteen. Seven works feature members of the London Sinfonietta, and two short electroacoustic works frame all the instrumental compositions: Wolfie by Jo Thomas and Steamin’ by Peter Batchelor generate richness from the sound of a female voice and steam locomotives, respectively. David Horne’s Broken Instruments is the first instrumental composition to strike the ear. Its octet includes the less common harp and guitar, and now and again we’re in Lachenmann-like territory with unexpected gritty and percussive colors. Rolf Hind may be the most familiar name here — an accomplished pianist of his own and others’ music — and he plays his Solgata, a piece for prepared piano. Dreamy and restless, Solgata (a Swedish word for the sun’s path on water) is one of those rare prepared-piano pieces that stands away from Cage’s influence. Tansy Davies, who kicked off the Hoxton collection, has something here: Small Black Stone is a short volcanic work for viola and piano that gives the violist much to do. Big ensemble pieces include the first parts of Fraser Trainer’s The Colour of Scars, which jolts and lurches with a solo saxophone to the fore. Richard Ayres’ No. 24 Noncerto is the longest work here, perhaps the most theatrical one, and seems a throwback to the unstructured anti-establishment music of the 1960’s and 70’s. I’m sure a live performance would be more convincing than a recording of what sounds random and unpremeditated. Both these NMC discs involved the recording, editing and mastering skills of David Lefeber, whose own Metier label (http://www.metierrecords.co.uk/) is crucial to documenting and promulgating contemporary music. NMC products that focus on a single composer are more satisfying. Recent releases include discs devoted to the music of Vic Hoyland (NMC D072) and the curator of the Hoxton New Music Days, John Woolrich (NMC D071). Intricately detailed chamber works by Lyell Cresswell are on NMC D077, a disc I hope to discuss at some length in a future ramble on new recordings of string chamber music. Going back a few years, Simon Bainbridge’s searing orchestral and chamber settings of poems by Primo Levi are on NMC D059, and Anthony Payne’s completion of Elgar’s Third fills NMC D053. A sentence in every NMC booklet I’ve seen explains their mission: “NMC is a charitable company established for the recording of contemporary music by the Holst Foundation.” I’m not sure what music by the Holst Foundation might sound like, but I hope NMC continues to record contemporary music for a mightily long time. Kunsu SHIM: relations (1995), Chamber Piece No. 1 (1994); Burkhard SCHLOTHAUER: 64 events (1998); Manfred WERDER: bassflöte bassklarinette viola violoncello (1998); Carlo INDERHEES: ZWEIUNDZWANZIG MINUTEN (Septett)1 (1997-98). Ensemble Q – O2: Myriam Graulus (flutes), Dirk De Scheemaeker (clarinets), Lucy Graumann (alto), Micheline Dumortier (guitar), Silvia Tentori Montalto (violin), Julia Eckhardt (viola), Gabriella Strümpel (cello). Edition Wandelweiser Records EWR 0104 (http://www.timescraper.de/). Radu MALFATTI: Die Temperatur der Bedeutung (1997); Das Profil des Schweigens (1997). Radu Malfatti (trombone); Clemens Merkel, Joanna Becker (violins), Konrad von Coelin (viola), Marcus Kaiser (cello). Edition Wandelweiser Records EWR 9801 (http://www.timescraper.de/). More notes do not necessarily mean better music. There’s wisdom in the cliché that less is more. But even less is not even more; even less can be almost nothing. NMC releases somewhat mainstream contemporary fare, but Edition Wandelweiser Records produces discs that could exasperate the most experienced and open-minded listener. Many of the composers who are represented on Wandelweiser embrace silence and tend toward sounds made by nonstandard methods of play or production. Tempos are generally slow and dynamics usually soft, and each sound is the most important event at that moment, as if there have been no sounds before and will be none to come. Four composers who are part of the Wandelweiser group present five pieces on a disc featuring Ensemble Q – O2 (EWR 0104). The Wandelweiser group makes no apologies about the “experimental” and “radical” — words taken from the booklet — nature of this music. There are no themes or cadenzas, virtuosity is banished. The only things remaining are musicians creating sounds. Imagine the coarseness of Lachenmann combined with the wide-open spaces of Feldman. Actually, Feldman could have used some of the titles himself, and some of the works take Feldman’s gestures to an extreme of stasis. Kunsu Shim’s relations, for violin, viola and cello, opens with silvery sul ponticello notes and stays on the edge of the barely audible. Most of the notes are harmonics or played sul ponticello, but there are a few ordinario cello notes. It’s short at 5:06 but it speaks volumes, compared to Shim’s other work on this disc. At four seconds long (yes, 0:04), Shim’s Chamber Piece No. 1 might be the shortest track on any CD. There are six credited players (voice, flute, clarinet, violin, viola and cello), though the strings are hard to hear under the two high-pitched wind notes. I don’t think Shim was trying to out-Webern Webern (actually, out-Kurtáging Kurtág is more like it). He wanted to create an intense moment of music, pregnant with expectation. Burkhard Schlothauer, mentioned here before, is represented with 64 Events for voice and string trio. Despite the title, this is not the sort of piece that you count your way through. It opens with a throat-scarring rasp. After a pause, instruments and voice come together to make different chords and timbres. Gentle chords, rough clusters, humming sounds or single string tones are separated by wide silences. At some places, it sounds as if the performance instructions demand that a note be played as slowly as possible so that the bow’s frail quaver at absurdly slow speeds becomes part of the sound. Manfred Werder’s composition bassflöte bassklarinette viola violoncello is similar to Schlothauer’s except the pitches occur singly, one after another. I heard no simultaneities at all. Every pitch is an oasis, and some have subtle tone changes or glissandi. If there is a tune, or if two neighboring pitches have a relationship, then I missed it. Carlo Inderhees’ ZWEIUNDZWANZIG MINUTEN is pretty much as titled. For 22 minutes seven players create short and quiet events that hover around the same chord. It’s a bit like watching paint dry as the sun sets and the room gradually grows dark. Ensemble Q – O2 plays with flair and confidence. Hecklers would have a field day at their live performances. Ensemble Q – O2 plays music for folks who like to be challenged. On this recording, without audience noise, this music comes across very earnestly and convincingly. Radu Malfatti is another industrious composer from the Wandelweiser group, and EWR 9801 contains two of his works. Both pieces are 2000 seconds long (listed as 33:20) and both consist of sounds created by nontraditional methods. Die Temperatur der Bedeutung is for trombone alone and is played by Malfatti himself. Conventional pitches are nonexistent. I’d guess that the work is played with just the mouthpiece or by blowing directly into parts of the trombone. Das Profil des Schweigens also eschews conventional pitches. The string quartet produces sounds by bowing across the tailpiece and other parts of the string instrument. The notes imply that the string quartet work was assembled from four separate recordings, one of each player, mixed together in the studio. Not everything Edition Wandelweiser Records puts out is as experimental. In August of 2002, I mentioned the music of Hermann Meier, a neglected Swiss composer, whose disc of piano works played by Dominik Blum (EWR 0001) reveals a composer engaged in serialism who went on to convincing graphic scores. EWR 9902 introduces chamber music of Herman van San, a neglected composer from Belgium who worked with Scherchen and Xenakis, and was one of the first to propose a system of music based on mathematical models. Wandelweiser has also released some Nono (La lontananza nostalgica utopica futura on EWR 0102), and I expect to say a few words about it in a later report.